Atlas carried the weight of the world on his shoulders, and while San Francisco’s police officers don’t bear as much, they do carry a significant amount. Setting aside their bulletproof vests and boots, most officers carry between 20 to 30 pounds of weight on their gun belt — a heft that has made back problems endemic to the profession. “I don’t know a cop that doesn’t have a back problem,” said Commander David Lazar, who runs the Community Engagement Division for the San Francisco Police Department. In fact, back problems are so widespread within the profession that, in 2001, California Labor Law gave officers the presumption that if they wore a duty belt for five years and they have back problems, the gun belt could be blamed. With Tasers again being considered by the Police Commission Nov. 3, the SFPD gun belt’s bulk and balance could get even more complicated. The duty belt, which is often referred to as a Sam Browne belt, goes all the way back to 1860s, when Browne invented it to carry his sword, a pistol and a set of binoculars when he was in the British Army. It has largely remained the same since then, according to Ira Janowitz, an ergonomics expert who studied the physical impact of the duty belts on the California Highway Patrol in 1998. Today, the belt is generally two inches wide. It is increasingly made of nylon, but leather belts remain the most common. 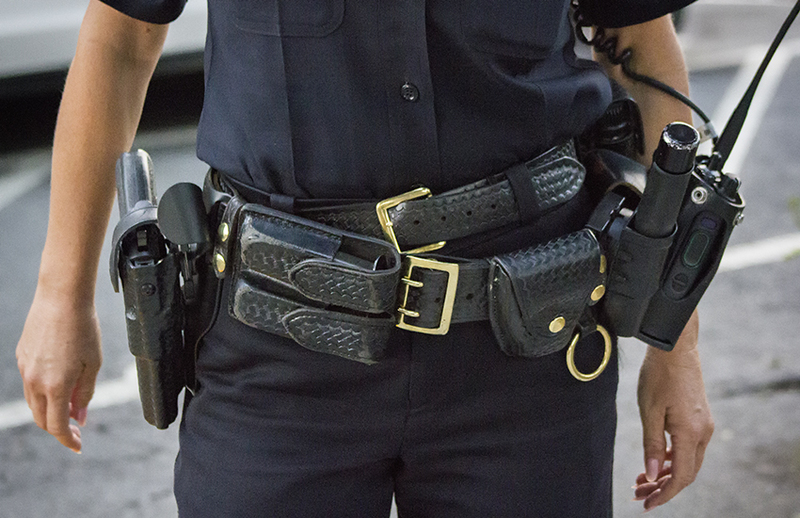 The belt’s various clips and attached pouches make an officer’s tools readily accessible while leaving their hands free. The two-inch belt carries a lot. SFPD officers are required to carry at least one pair of handcuffs, a flashlight, baton, radio, pepper spray and a handgun with two extra clips. Affixing a Taser would add another two pounds. And, more important, it would complicate an officer’s ability to balance their belt’s weight, according to Janowitz. In his studies, Janowitz found that “balance is more important than the actual weight.” The problem, he said, is that properly balancing a belt might not be compatible with placing an officer’s tools in places where they can be most easily accessed. This is further complicated for officers with a slender frame, according to Janowitz, because they offer less real estate to place their tools. Not all of the belt is optimal for use, according to Janowitz. When an officer positions their tools on their back, they will likely not have proper lumbar support when they sit down. And even if they put their weapon on the side, their holster will dig into their lower ribs as it is pushed up. 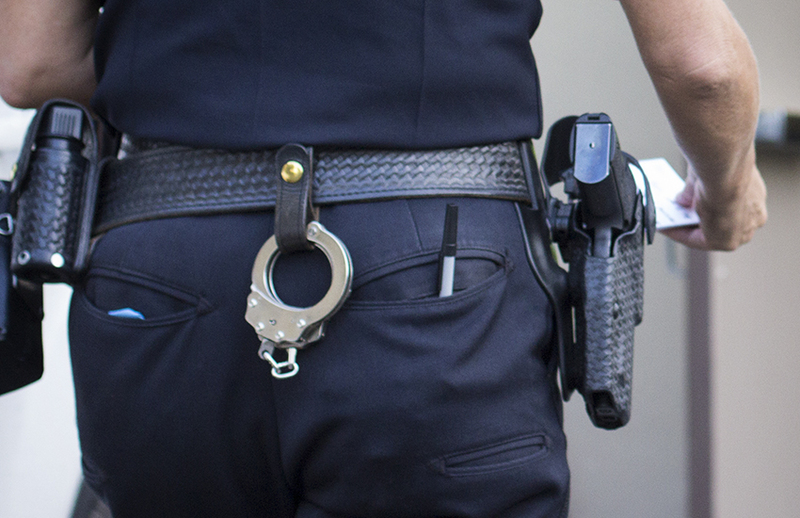 Many officers carry their handcuffs on the back of the belt. But if they fall onto their back in an altercation, the handcuffs could damage the sacrum or the lumbar portion of the spinal cord and cause a serious injury, according to Janowitz. The Janowitz study recommended having a variety of holsters available to meet the individual body types of an officer, modifying the seats in patrol cars, and changing the leather Sam Browne belt to a nylon one. An officer walks towards a meeting on Oct. 16 in San Francisco. Photo by Nikka Singh. A nylon belt provides more cushion, with softer contours around the belt, and it would not dig into an officer’s side, Janowitz found. It allows for a greater range of customization with velcro adjustments, as traditional belts only feature increments of an inch or wider. While his study was conducted nearly 20 years ago — and similar studies have found comparable results across the country — the SFPD still continues to issue leather belts to its officers. The decision to keep using them is made by a uniform committee, said Officer Grace Gatpandan of media relations. However, the SFPD allows nylon belts if an officer has a doctor’s note, which must be submitted for approval. Gatpandan could not provide any data on the number of people using the nylon belts, nor the number of officers who have filed worker’s compensation claims as a result of back problems. Officer Kaczmarczyk expressed concern over the duty belt’s limitations. “I wish there were different ways of carrying gear, like the cops in England,” he said, referring to a stab-resistant vest that allows for officers to carry some of their gear on their vest. Janowitz agreed that such vests need to be looked at more carefully, as they provide a much better distribution of weight. And it also keeps equipment away from an officer’s back, which could interfere with proper lumbar support or cause injury. The SFPD wouldn’t have to go far to test the vests, since their SWAT unit members already wear tactical vests and leg holsters. However, such units have a more militant look, and it seems like the regular police force is reluctant to adopt that appearance, despite the health benefits. Officer John Sanford, who works in the Community Engagement Division said, “Sometimes a military look or a profile can be somewhat intimidating to some communities, so for that reason I can see us addressing that accordingly,” which is to say that the vest is an unlikely option. The Police Commission has scheduled a special meeting on Nov. 3 at 5 p.m. at City Hall to discuss Tasers and whether or not to take action on them. If the commission approves them, they are likely to be just one more item on the belt.